On July 21st, frustratingly heavily redacted copies of the FISA warrant applications for Carter Page were released to the NY Times under the Freedom of Information Act. Often several pages in a row are completely redacted. Getting anything coherent out of documents is a massive challenge. Even so, I offer a few nuggets in summation. The heavily redacted documents include the FBI’s sworn affidavits in support of the FISA warrants, the Attorney General’s certifications of said requests, and the judges’ actual approval of the search warrants. It also includes the similar documents for the three renewals granted after the first warrant. 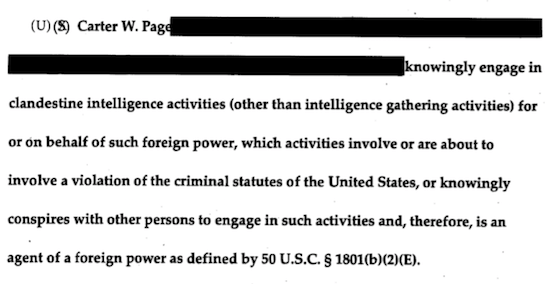 Thus, a total of four FISA warrants were applied for and issued. All four FISA warrants were approved by four different Republican appointed judges. The first warrant was approved by Judge Rosemary Collyer, appointed by Bush in 2002. The second was approved by Judge Michael Mosman, appointed by Bush in 2003. The third FISA warrant was approved by Judge Anne Conway, appointed by the elder Bush in 1991. The fourth, and final FISA warrant, was approved by Judge Raymond Dearie, appointed by Ronald Reagan in 1986. This was not one “rogue” liberal judge approving these FISA warrants. Four different judges approved the FISA warrants, all of them appointed by Republicans. In the first application for the FISA warrant Trump was a candidate for President. In the second and third applications he was the President-elect. In the fourth application, Trump was already President. Those last three Republican appointed judges approved these warrants, knowing Trump would likely to hold this against them, and not promote them to higher judicial office. The FBI affidavits directly state the FBI believes Carter Page acted as an agent of the Russian government in “collaborating and conspiring with the Russian government” to “undermine and influence the outcome of the 2016 U.S. Presidential election.” (see screenshots below). The FBI does indicate that it finds the weakening of the Republican Party Platform’s language against the Russian invasion of Ukraine, something it views as engineered by Page, as suspect. Again, the facts supporting that are heavily redacted. Christopher Steele (Source #1), author of the “Steele Dossier,” is repeatedly described by the FBI as a source with a long history with the agency establishing that he is a trusted and reliable source. “Notwithstanding [Steele’s] reason for conducting the research into [Trump’s] ties to Russia, based on [Steele’s] previous reporting history with the FBI, where by [Steele] provided reliable information to the FBI, the FBI believes [Steele’s] reporting herein to be be credible.” (See pages 15 & 16 of the first affidavit). In subsequent affidavits the FBI explicitly informs the judge they have ended their relationship with Steele, but only because Steele broke an agreement to not take his findings to the press. The FBI continues to state they believe Steele’s investigation results to be credible. Beyond all this it is helpful to review what the four different Republican appointed judges found probable cause for. As I previously discussed, a judge must find there is probable cause that an American citizen is acting on behalf of a foreign power in a way hostile to the United States. In essence, the judge must find probable cause that the target is a traitor to his country on behalf of another country. Four different Republican appointed judges found there was probable cause for that. Below are some relevant screenshots from the affidavit. Russia Recruited Page To Meddle In The Election. And Page Allowed Himself To Be Recruited. Becoming An Agent For a Foreign Power.